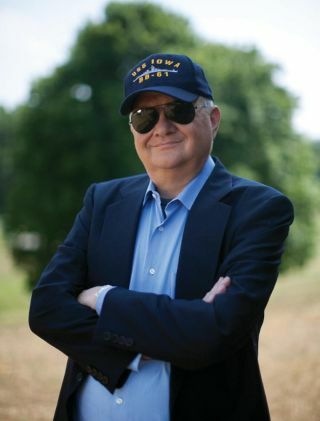 Author Tom Clancy, best-selling writer and entrepreneurial space supporter. Tom Clancy, the best-selling writer and master storyteller of military thrillers who died Oct. 1 at age 66 in a Baltimore hospital, was also an early supporter of entrepreneurial space. Clancy authored such runaway best-sellers as "The Hunt for Red October," "Red Storm Rising," "Patriot Games," "Clear and Present Danger," and "The Cardinal of the Kremlin," which featured anti-satellite lasers and other "Star Wars"-type weaponry. "Clancy deserves the recognition," said Gary Hudson, CEO of Nevada-based HMX, Inc.
Hudson has been involved in private spaceflight development for more than 40 years and is perhaps best known as the founder of Rotary Rocket Company. That visionary firm was dedicated to the development of a single-stage-to-orbit launch vehicle that used a rocket-tipped rotor propulsion system. Hudson and company colleagues designed a unique vehicle known as the Roton. Rotary Rocket built a landing test simulator, the Roton Atmospheric Test Vehicle (ATV), which flew three low-altitude test flights in 1999. Tom Clancy took part in the March 1, 1999, rollout of the Rotan ATV as an investor and strong supporter of Rotary Rocket Company. Rotary Rocket Company spaceship was a novel single-stage-to-orbit launch vehicle that used a rocket-tipped rotor propulsion system. "My interaction with Tom began in either late 1989 or early 1990," Hudson recalled. "At the time, the Single Stage Rocket Technology program was starting up at the Strategic Defense Initiative Organization, and I had a fair amount to do with that effort." During that time period, science fiction writer Jerry Pournelle introduced Hudson to Clancy, who was a fan of Pournelle’s writing. "I was astounded by both his enthusiasm and his drive," he said. "We wrote a business plan for a new company, calling it Pacific American Spaceship Company. Tom was tireless in trying to find funding. But in the end, even with his contacts, the fact that the government was doing a 'competitive' effort, the Delta Clipper-X, meant that we couldn’t put a deal together. But I did meet a lot of people with both money and power in D.C. and elsewhere, names that had best remain, well, nameless." Hudson later teamed up with colleague Bevin McKinney in 1993 to develop the Roton concept, keeping Clancy informed of the enterprise. Entrepreneur Walt Anderson, an early advocate of the commercial development of space, agreed to put the first $5 million into Rotary in fall 1996, Hudson said. "I happened to be visiting Tom and proudly told him about the venture. I knew that previously his first wife was not keen on him investing in such things, but he had just gotten divorced and was living in Baltimore in a condo. Even so I had no expectation that he’d invest," Hudson said. Hudson recalls sitting with Clancy when he said, "Let me know when you are ready to take more investment. I have someone who is interested." "I asked, 'Who?' and he pointed a finger at his chest and said, 'Me!' So the first round of Rotary financing included $1 million from Tom," Hudson said. Rotary Rocket spaceship is on display at the Mojave Air and Space Port in California, the site of several Roton Atmospheric Test Vehicle (ATV) test flights. Hudson said that Clancy then joined the board of Rotary Rocket, followed the group’s work with great interest and offered to speak at the Rotan ATV rollout. "He showed up wearing a train engineer’s cap. He was a huge rail aficionado, a bit like Sheldon on 'Big Bang Theory,' and talked about opening a railroad to space. After Rotary failed to raise sufficient funds to continue in late 1999 and early 2000, I spoke to him about what to do next. It was clear Rotary was doomed, so I finally resigned in mid-2000." "I don’t think he’d mind me sharing it with the world now," Hudson said. Gary, it is with sorrow that I read your letter this morning. It’s never fun to see a dream die, all the more so one in which I believe myself. And I continue to believe in you, your brains, your vision, and your ultimate ability to make it happen. If I'd had the money, I would have funded the damned thing myself. You see, I think the market is there. I wish there were some way I could help, but clearly there is not. I’m still your friend. "And I am still his," Hudson said. "He was a true self-made man, both generous and bold. Rest in peace."